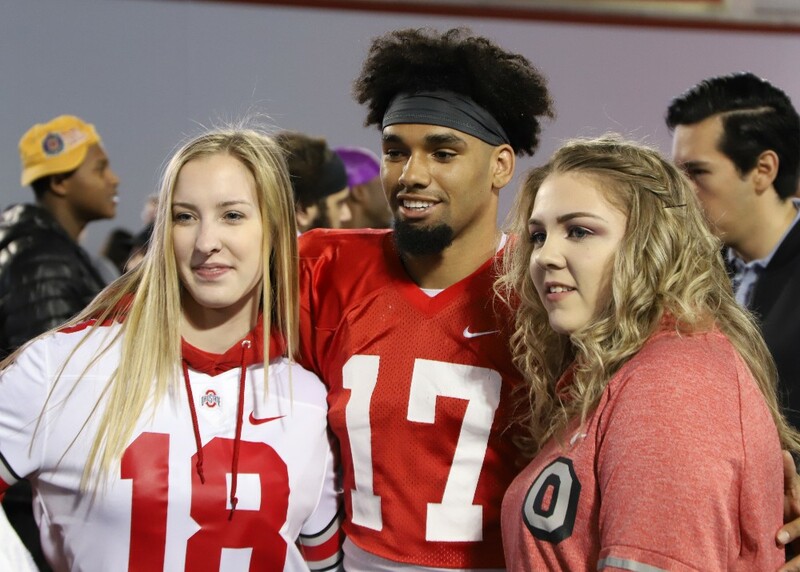 COLUMBUS — Ohio State held its annual Student Appreciation Day practice on Saturday. The practice, which was the fifth of camp, was open to the media as well, which gave us plenty to watch, but not a lot of answers. 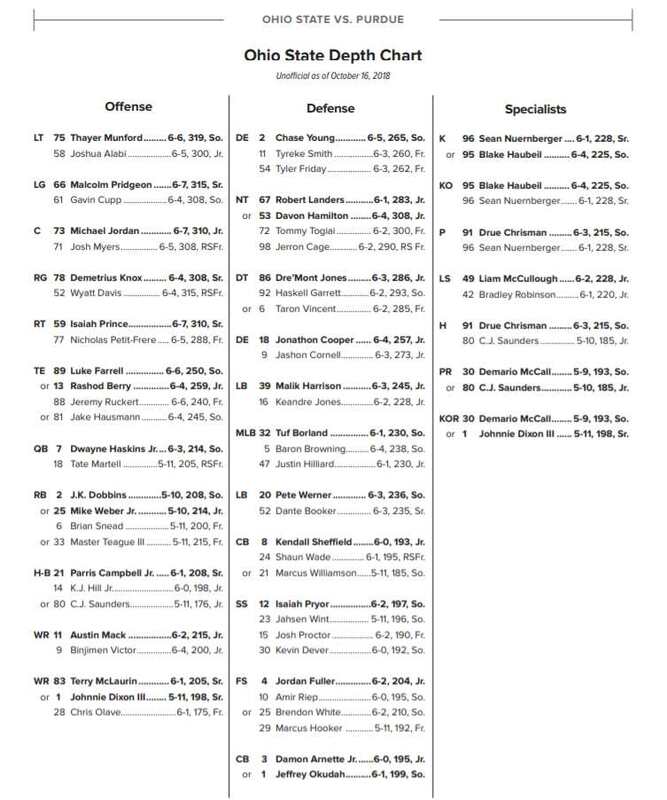 Things are still early and there is so much mixing and matching that devising a depth chart is as much guesswork as anything else. Sophomore quarterback Justin Fields was with the first team for most of the practice today, but Ryan Day said that redshirt freshman Matthew Baldwin also spends time with the ones and will again. There were a lot of established players missing with various minor injuries. Middle linebacker Tuf Borland was wearing a knee brace. He suffered a hit to the knee in a previous practice and this was just precaution. Baron Browning was also held out following a hamstring tweak. Ryan Day provided some other updates on injuries and illnesses after practice. Linebacker Justin Hilliard was carted off following a leg injury. Because the top two middle linebackers were out, that allowed sophomore Teradja Mitchell to play with the ones for the entirety of practice. He was active throughout. When Justin Fields was in, there was an uptick in the read option, and he was very effective at it. His best run was a scramble after his first read wasn’t open. He pulled the ball down and picked up about 30 yards before being “touched” down by Isaiah Pryor, who was playing deep safety. The Buckeyes had four linebackers on the field on this play. Day said that Fields has picked up the offense well, and that appeared to be the case today. The lone interception of the day came from Matthew Baldwin, who tried to drop a corner route into KJ Hill, but it was picked off by Amir Riep. Jashon Cornell had a nice sack of Fields from his three-technique position. He made a quick move outside and was too quick for the lineman across from him. Speaking of the offensive line, today it was Branden Bowen (LT), Gavin Cupp (LG), Josh Myers (C), Wyatt Davis (RG), and Nicholas Petit-Frere (RT) with the ones. Josh Alabi was out with flu-like symptoms, which is why Bowen moved over from right tackle. Sophomore safety Josh Proctor’s name was called quite a few times over the PA as he made plays in drills. Trying to figure out the defense is a tough situation. Sometimes there are three linebackers. Sometimes there are two with a bullet. Sometimes there are three with a nickel and then Brendon White moves back to safety. Sometimes White is at bullet for one play, then he moves to safety on the next play. Wade was with the safeties today, which he has been throughout the spring. It appears that right now he and Pryor are the ones, except for when White is in, and now you start to see why trying to come up with a depth chart is like trying to build an underwater sand castle. Freshman receiver Garrett Wilson had a very good day. He made a great catch down the sideline, getting one foot in while being draped by a cornerback. He is smooth and fast and there is no delay when he gets the ball and turns to run. Redshirt freshman Jaelen Gill had some very good moments as well, scoring once in red zone on a quick dump off pass that saw him go 20 yards through traffic down the right side. Junior receiver Jaylen Harris also impressed. Senior Binjimen Victor had some drops. Senior Austin Mack was playing Z today, as opposed to his normal X. Day said it was about getting the three best receivers on the field. Mack playing both gives him more value. Sophomore tight end Jeremy Ruckert had a few catches. In two tight end sets, he was effective flexed out and also coming in motion and catching the bootleg. + This dude won a year’s worth of Chick-Fil-A. + The Buckeyes have a wide receiver drill that features one receiver blocking a defensive back one-on-one, then another receiver running with the ball behind the blocker. The defender has to find a way to shed the block and tackle the ball carrier. Sophomore receiver Chris Olave had a very good day blocking in this drill. + The impression I got today is that if Justin Fields wins the job, they will use his running ability enough to really annoy defensive coordinators. + JK Dobbins looked fast and decisive, hitting the corner several times on red zone runs. + Branden Bowen and Chase Young had some good matchups on the day, taking turns getting the better of each other. + There were times when Pete Werner was on the short side of the field and other times he was on the wide side. Same for Malik Harrison. + Senior offensive lineman Kevin Woidke caught a tipped pass and took off upfield showcasing his athleticism. He even stuck a stiff arm out there. + Jaelen Gill made a defender miss that brought out reaction from the high school players in attendance. + There was a bit of a fight between the offense and defense in the red zone on a third and three. On the next play, Fields found Chris Olave for a touchdown on a slant. Arnette bit on a fake to the outside and Olave was left open. + Jeff Okudah and Chris Olave were the gunners. + Master Teague had some struggles in pass protection drills. + There was a graphic of the opening line for the Michigan game on the video board. + Former Buckeyes Cardale Jones, Mike Adams, JB Shugarts, Johnnie Dixon, Terry McLaurin, and Dante Booker were in attendance. through his career. Hope it gets fixed this season. Liked the note on Fields in the RPO (is that still in vogue?) and especially JK looking fast and decisive. Great updates as always, Gerd. Thanks.